MINNEAPOLIS (AP) Bobby Wilson helped Kyle Gibson turn around his pitching after a rough first inning. Then, for at least one afternoon, the veteran catcher fixed his own struggles at the plate. Wilson went 2-for-3 with three RBIs, Gibson recovered from a shaky first to throw seven innings, and the Twins beat the Baltimore Orioles 5-4 on Saturday. Max Kepler homered in his second straight game to help send the Twins to their third win in a row. The Twins didn’t bring in Wilson for his offense – his two-hit day raised his batting average to .134 – so they’re not expecting him to deliver game-turning hits on a regular basis. But that’s exactly what he did with an RBI single in the fifth that made it 3-2, and a two-RBI double the next inning that proved the game-winner. It was Wilson’s first multi-hit game since Sept. 21, 2016. ”I feel like I’ve been doing everything I can defensively but it’s time to start turning that corner and start contributing offensively as well,” Wilson said. Earlier in the day, the team needed Wilson’s smarts behind the plate to recover from an early hole. ”After the first inning we sat down and I said `Gibby talk to me, what do we got to do? What’s going to turn this around?’ So we talked about a few things and we kind of stuck with that game plan for the rest of the game,” Wilson said. The team with baseball’s worst record, meanwhile, lost its fifth in the row and fell 40 games below .500. That certainly seemed the case Saturday. Coming off his best start of the season against the L.A. Angels, Gausman had a 3-0 lead before ever taking the mound and looked sharp early. Gausman faced the minimum number of batters through the first three innings, and allowed a single hit through the first four. But things turned quickly in the fifth. With one out, Kepler homered to left-center, Robbie Grossman doubled, and Jake Cave and Wilson followed with singles. After Joe Mauer walked, Cave scored on a wild pitch to tie the game. Gausman, who held the Angels to one run and two hits without a walk in eight innings last Sunday, didn’t return for the sixth. The Orioles loaded the bases in the third with two outs, but Gibson struck out Danny Valencia swinging to end the threat. After that, Gibson allowed a leadoff double to Jonathan Schoop before retiring 10 in a row. 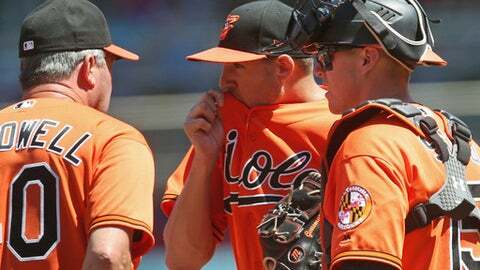 Orioles: OF Trey Mancini got a rare day off, but manager Buck Showalter said he was fine. The manager said it was more about getting Peterson a chance to play. Peterson went 1-for-3 on Saturday. Davis’ strikeout against Hildenberger in the eighth was the 1,306th of his career, moving him past Cal Ripken, Jr. for Baltimore’s franchise record. ”You play long enough, you’re going to swing and miss enough to apparently set some records. There’s not really much to say about that,” Davis said. Orioles: Alex Cobb (2-10) takes the mound for Baltimore in the finale. He hasn’t won since June 5 against the New York Mets. Twins: Jake Odorizzi (3-6) makes his 19th start of the year as the Twins go for the sweep. His last outing against Baltimore was March 29, when he shut out the Orioles over six innings on two hits and two walks.